By combining data from NASA’s Solar Dynamics Observatory and the Reuven Ramaty High Energy Solar Spectroscopic Imager, scientists were able to create a comprehensive view of magnetic reconnection in action. Two NASA spacecraft have provided the most comprehensive movie ever of a mysterious process at the heart of all explosions on the sun: magnetic reconnection. Magnetic reconnection happens when magnetic field lines come together, break apart and then exchange partners, snapping into new positions and releasing a jolt of magnetic energy. This process lies at the heart of giant explosions on the sun, such as solar flares and coronal mass ejections, which can fling radiation and particles across the solar system. Scientists want to better understand this process so they can provide advance warning of such space weather, which can affect satellites near Earth and interfere with radio communications. One reason why it’s so hard to study is that magnetic reconnection can’t be witnessed directly, because magnetic fields are invisible. Instead, scientists use a combination of computer modeling and a scant sampling of observations around magnetic reconnection events to attempt to understand what’s going on. Now Su has added a new piece of visual evidence. When searching through observations from NASA’s SDO, short for Solar Dynamics Observatory, Su saw something particularly hard to pull from the data: direct images of magnetic reconnection as it was happening on the sun. Su and his colleagues reported on these results in Nature Physics on July 14, 2013. While a few tantalizing images of reconnection have been seen before, this paper shows the first comprehensive set of data that can be used to constrain and improve models of this fundamental process on the sun. Magnetic field lines, themselves, are indeed invisible, but they naturally force charged particles – the material, called plasma, which makes up the sun – to course along their length. Space telescopes can see that material appearing as bright lines looping and arcing through the sun’s atmosphere, and so map out the presence of magnetic field lines. Looking at a series of images, Su saw two bundles of field lines move toward each other, meet briefly to form what appeared to be an “X” and then shoot apart with one set of lines and its attendant particles leaping into space and one set falling back down onto the sun. To confirm what they were seeing the scientist turned to a second NASA spacecraft, the Reuven Ramaty High Energy Solar Spectroscopic Imager, known as RHESSI. RHESSI collects spectrograms, a kind of data that can show where exceptionally hot material is present in any given event on the sun. RHESSI showed hot pockets of solar material forming above and below the reconnection point, an established signature of such an event. 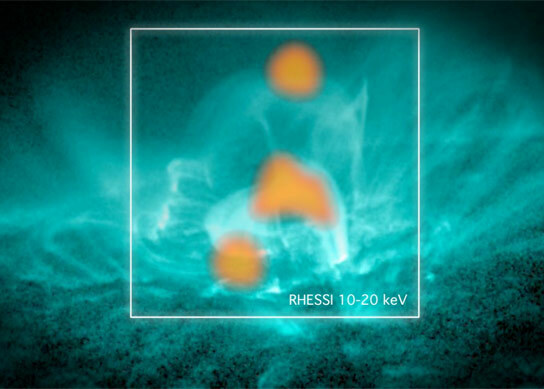 By combining the SDO and RHESSI data, the scientists were able to describe the process of what they were seeing, largely confirming previous models and theories, while revealing new, three-dimensional aspects of the process. Below the surface of the sun, the charged material, the plasma, is flowing. Magnetic loops emerge from this flow and set up areas of positive magnetic poles lying next to negative ones. The loops arc up over the sun from one polarity to the other. As the sun’s material continues to flow under the surface, the positive and negative poles slip past each other – not unlike tectonic plates on Earth slipping past each other – though on the sun, of course, the material is a hot gas, not hard rock. This causes the arcs above to grow, twist sideways and become more unstable. The very act of that slippage, or shear, puts more energy into the system, coiled and waiting to spring, like twisting up a rubber band before letting it loose. Eventually the magnetic field lines in the arcs buckle inward, touch and reconnect, while giving off a bright flash as the energy releases, sending radiation and energetic particles out into space. In the SDO movies, light illuminates the arcade of loops as the reconnection process cascades along the length of them. Bright loops lean into the reconnection region from each side. As the magnetic field lines reconfigure, new loops are ejected downward, while a rope of plasma separates and surges upward. In certain cases, the rope achieves escape velocity and becomes a coronal mass ejection, sending billions of tons of matter out into space. Su said that with these images they could make estimates as to how quickly the magnetic fields reconnected, as well as how much material goes into the process and how much comes out. Such information can be plugged into magnetic reconnection models to help refine theories about the process. Scientists want to learn more about magnetic reconnection not just because of what it does on the sun, but because it is a universal process, which occurs near Earth, inside its magnetic environment, the magnetosphere, and in stars everywhere. Because it’s so difficult to see this process on the sun, and it’s also a difficult process to re-create and study in the lab, researchers plan to take a closer look at magnetic reconnection in space. To study magnetic reconnection in even more detail NASA will launch the Magnetospheric Multiscale (MMS) mission in late 2014. MMS is made of four spacecraft that will pass right through magnetic reconnection events where they happen in Earth’s magnetosphere. By bringing multiple spacecraft – SDO, RHESSI, MMS and others – to bear on the problem, scientists will be able to better understand the very start of the space weather we experience on Earth. These results were obtained under a joint research project of the European Commission and NASA called HESPE, short for High Energy Solar Physics Data in Europe. Be the first to comment on "NASA Spacecraft Observe Magnetic Reconnection in Action"